Xmas was nice, nothing to report about that. So this is an after the storm report. A few days ago Scandinavia was hit by a storm. Here in Oulu it meant strong winds, temperature around freezing and rising sea levels. The sea got 1.8m above the normal, and flooded some parking lots near the sea and cut off some roads and paths near to the coast. As the temperature was near zero degrees Celsius and it was raining and snowing and then freezing again, and the wind pushing people around the meteorological institute issued a warning for "difficult conditions for pedestrians". Warnings about difficult conditions for drivers are more usual, so the conditions were really nasty for walking and cycling. The westerly wind pushed some ice rafts upstream (or stopped them going out to the sea, who knows) on the mouth of the river. Here I'm on the bridge seen on my dirty bridge video. The flow of the river tries to take the ice away, and wind kept pushing them back. The ice chucks were about 5 inches thick. Which btw. is almost strong enough to hold a small car. The waves broke the ice and pushed them on top of each other. Not a very good photo, but that's some rowing boats upside down in the water. Many people pull their boats to dry ground and turn them over for storage. The boats will not get filled with water which makes them easier to use. And in winter the water will freeze and expand, which might crack the boat. All bikeways were rather icy, but especially nasty were some crossings where the street was snowplowed after the bikeway. A pile of snow was left, and when people walked and rode over it, it flattened and froze. Only it had nice 4 inch deep grooves on them, to capture your wheels. On the other hand, the other sections were in pretty good condition. Today it was snowing. I took some photos of fresh tracks on the bikeway, but it was too dark already and I didn't get any good ones. And I tried to take an 'artistic' shot of a church, but it was lousy too. Blah. So you don't see them :-D Maybe better luck tomorrow. Or Next Year! That's one phrase that came to my mind when I was trying to ride uphill on the icy bikeway. The short bikeway on the photo has not been gritted and is probably one of the lasts on the todo list. Other low priority bikeways had not been gritted yet. With the forecast promising temperatures between -1C and +1 C it will be needed, unless they expect all the ice will melt away? When the rear wheel started slipping when I pushed down on the pedal, I decided to take it as a sign that I'm getting stronger. I don't recall that happening in the summer! Not that the low gear I had on had anything to do with it. With two bags of shopping weighing me down and an uphill, gears are great. It's been a little over a year since I opened this blog. It started because I was reading cycling blogs from around the world and someone said you can't cycle in the winter and you don't need bikeways. I wanted to show them wrong. The best cycle infrastructure is in The Netherlands, so you can go read Hembrow's blog what it looks like. Copenhagenize gets some snow so they can brag about how well those bike paths around the city are cleaned. But neither of those great cycling propaganda sites said how important segregated bikeways really are for cycling in the winter. I did, in the post about Bikeways in the winter. Then I noticed I had said pretty much everything there was to be said about it and started writing junk. According to the stats, the most popular posts have been The EST and Bikeways in the winter. I'm sure these are the most popular posts because they were early in my blogging career. They got hits because curious people came to see the new blog. The other posts were visited my me. Later in the year it was obvious that I write mostly junk posts and nobody bothered anymore. Or maybe it was because I started using other aliases for commenting on other blogs and they couldn't follow me here. Today I spent a few hours cutting clips from videos from the previous year and editing and uploading the resulting fair weather cycling video to youtube. The screenshot of the video shows the almost-midnight sun from June. I already knew that I didn't have many usable videos from the mid-winter, as it was either too cold or too dark or both for my md80 clone. And my camera is not water proof so I didn't use it when it rained. So what you see on the video is kind of a fair weather cycling, all the rainy, dark and cold days removed. Although at the end of the video you can see me riding when it's raining snow/sleet. I was testing my new camera mount, again. I had the camera protected by thin, clear plastic out of a candy box, and it seemed to work well. And the candy was good, too! Two weeks since I last posted. What's happened since? Got some snow, which melted away. Repeat a few times. Last weekend we got more snow, followed rain and below freezing temperatures. Everything was glazed with ice. According to the newspaper the emergency rooms had a busier than normal weekend because people got wrist injuries etc. when they fell on the slippery ice. Even motorists were more careful than usual. The first two photos are from last week. And the last one shows the latest development in our campaign for global warming, the central heating under the pavement of Rotuaari, the pedestrian street downtown. 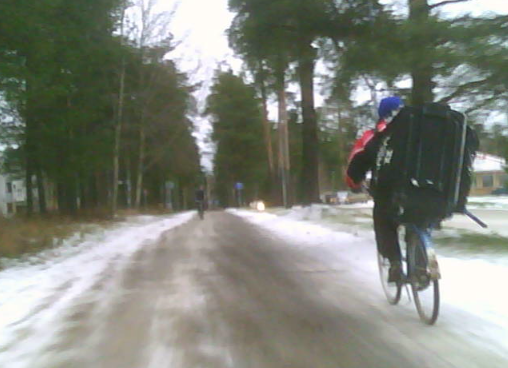 It snowed today, and all the streets and sidewalks had snow and ice on them, except the Rotuaari was ice-free. Which was nice. The blue sign on the left says "no bike parking on the plaza!" Another sign of lack of thinking from planners? Where are we supposed to park our bikes? And haven't they heard of the rule of fifteen steps? Any bike rack further than 15 steps from the door is too far and bikes will be parked closer to the door, if possible. Like a few scoff-law cyclists had done near the white semi-spere on the photo. I'm sure I've heard the excuses to ban parking on the plaza, but I've forgotten them. Maybe they had to do with them blocking the plaza when the pedestrian street is full of people. But the racks on the narrower streets off the plaza will be no problem, hmm? Maybe they want us to use the underground parking hall they're going to build. That would have a negative impact on cycling. Having to walk (more than 15 steps :-) from some far-way parking to the destination increases travel time. Also, it's been more than a year since my first post, so I'm working on a list of most popular posts. And I'm trying to find time to edit and upload some videos. My newest upload on youtube was shot in August. I was videoing my ride to downtown, when suddenly a bunch of cyclists got on the bikeway in front of me. Our speeds matched, so I ended up following them for a while. And near the end, I chose to follow them (turned left with them instead of turning right) as it seemed I might get some video footage. 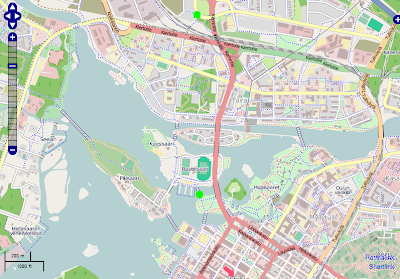 The green dot near the upper edge on the openstreetmap map is where the video starts. 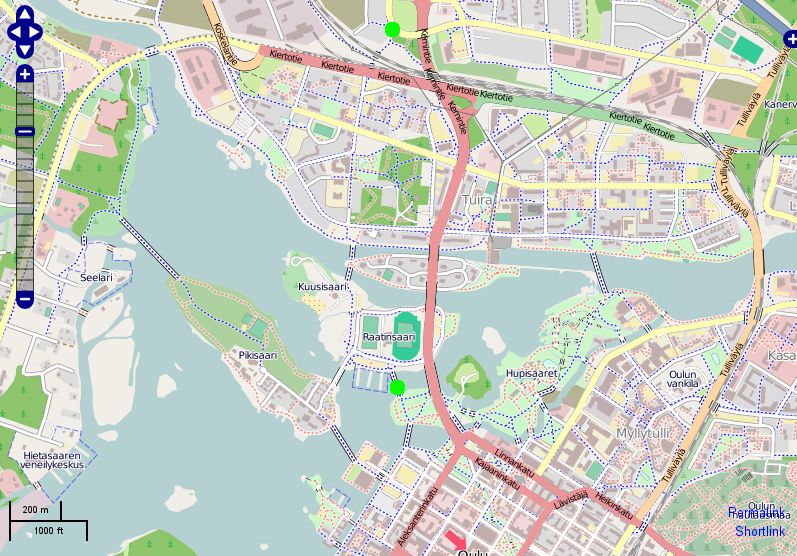 The lower green dot shows where I lost them when I stopped to take some photos of the bay and the bike bridge crossing it. The distance is about 1,5km as the crow flies. The route did not follow the "red road" across the river. Instead the route (blue dots show the bikeways) goes a little to the west of it, avoiding busier intersections with traffic lights. In fact, I've got many videos of crossing the river on the other bridges. But I'm not sure if I have any video from the red road bridge. That route has traffic lights on it and the traffic is noisier so it's not as pleasant and convenient to ride. So unless my destination is near that road I'll avoid it. Not a Soccer Mom, but a Ice Hockey Guy! The other night I had some spare time and I had lots of energy, so I built a new mount for my md80 camera. Last year I tried mounting the camera on my head, but aiming was almost impossible and I seem to shake my head a lot while riding. Then I tried various methods of tying/clipping the camera to brake cables etc, which was not an optimal solution. Then I got the bright idea of using the mount of my led light for the camera and that worked pretty well during the summer when I didn't need the light. The new mount was made of wood and on today's test ride proved to be good and solid, but needs another screw or some other method to tighten it up a little. Unfortunately the plastic strip where I clip the camera is not working as I hoped. It's not solid enough, and lets the camera vibrate. Today's test ride showed the camera was shaking, and due to the lousy low light capabilities almost all of the video would be unusable. The screen capture is about the best quality I got, showing mostly motion blurring from riding, not shaking. And the guy is obviously going to play ice hockey somewhere. I wonder if they've opened the outdoor ice rinks yet? I must remember to check them next time to see if they're open. A few months ago there was a mass ride in London, UK. I think it was a flashride on the Blackfriars Bridge, but it could've been some other event (maybe skyride?) . Anyway, the video showed lots of cyclists riding along the street. One of them had a video camera in her hand she was filming her kid. A few of the youtube commenters whined how dangerous that was: riding onehanded and filming at the same time. In my opinion she had plenty of clearance and the danger was minimal. Not soon after I saw the video I was riding downtown I saw a cyclist do one better than that: texting and riding one handed while dodging pedestrians! It snowed last night. Just a little to make everything white. Unfortunately most of it melted away during the day before I got to my camera. But you already know what it looks like: it's white. Today's first snow of the winter is almost two weeks later than the average. The permanent snow is due any day. There was a little mist/rain in the air on the way home in the afternoon. The forecast promised more rain/sleet for the evening and below freezing temperatures for the next few days. So if it snows instead of rains today, there might a chance this snow doesn't melt until spring. But I don't think so, as the ground is still too warm and has not frozen solid yet. The ground will melt the snow away. Just yesterday I wrote I can get by all year without studded tyres, but today I wouldn't have minded having them. The puddles were frozen through. The bikeways and streets were partially coated in black ice and while the bikeways had some gritting on them, the ice glistening on the asphalt on some streets I had to cycle on did not look like good cycling surface. I also noticed a bike rack near a bus stop. I'm not sure why it is so far away from the stop? Hidden from thieves on the road? Protected from snow plows? There's an underpass to the right so people using the bus stop on the other side of the road could park here too? Ah, that might be the reason: if a commuter parked his bike at the bus stop, he might try to run across the road dodging cars instead of using the underpass. Crafty road designers thought of that too! Bike rack (not so) near a bus stop. Shiny ice on asphalt. I stopped here and took the sunset photos. This is yet another bridge to cross the river Oulu. It has a dual lane carriageway (turnpike) and two-way bikeways on both sides of the car lanes. Just choose which side fits your route best. Getting across the car lanes is no problem, as there's underpasses on both edges of the bridge and further along too. More(?) cars going faster than on Blackfriars Bridge in London. If I had been driving a car, I wouldn't have noticed this meandering stream. I would have been going too fast to see anything except the road ahead. Also, I would have been on the road instead of the bikeway, so it would have been impossible for me to see it anyway. The stream is a very good example of meandering, but all those trees got in the way of getting a good photo. Also it was pretty dark in the shadows of the forest and the sun was setting so I had trouble getting a picture without blurring due to the long exposure times. But as the winter is ahead, I'm sure I'll get more practice. This stream is surrounded by roads and buildings, but it certainly doesn't look very urban. The path is made by dogwalkers and curious people who follow the stream to take photos of it. And 3 or 4 on this one. And a few sunset photos taken at 15:50 on a bridge I don't usually ride. In the photo you can see the railway bridge. I've taken some photos of the railway bridge from the other side, when I've been riding on the dam bridge. Look at the photo below. What you see is the result of parents bringing kids to the kindergarten by car. The kindergarten is on the right. The white fences are there to keep the convicts (kids) in. The kindergarten is at the end of two dead-end (for cars) streets. The other street has a bulbout where the parents can park the car while they take the kid in. This street does not have one, so the parents are forced to park on the grass, instead of the street. Apparently there's too much traffic (other parents dropping their kids) for that. And when it rains, the new parking lot turns into mud. In the photo the mud is actually frozen, so it does not look very muddy. Still, the mud gets on the asphalt from the tyres when the parents leave. You see the guy in blue behind the bollards on the photo? He walked through the mud to get to the MUP. Of course, the parents and the kids have to walk through that mud, too. Now this is more like it: mother and her kids on the MUP. The younger one had his learning wheels on and seemed a bit tired of pedaling. Were they on the way to home from kindergarten or going shopping? Anyway, they were going at their own pace! 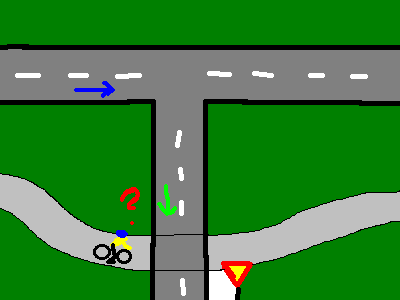 According to the Finnish law, a turning vehicle must yield to other traffic going straight. This includes cyclists on the street and on a bikeway next to the street. In the picture below, a vehicle marked by the blue arrow (or another coming from the other direction, doesn't matter) wanting to turn to the side street (green arrow) has to yield to the cyclist. Another part of the law says that the cyclist must yield when he's crossing the road at a bikeway-street intersection. And here comes the problem: How close must the bikeway be to an intersection to be considered part of the intersection? Here the bikeway is pretty far from the intersection, and some drivers might think the bikeway is a separate path. An extra yield sign at the "?" would have clarified the situation. The email also said that the traffic laws and other regulations set guidelines how to build intersections. They also set the default yielding rules that everyone expects. To deviate from the default settings would mean extra work has to be done to make cyclists safe. They don't build bikeway-street intersections where cyclists would have priority, because that would be outside of the norm. I hate that, I'd have liked to say we have at least one spot in Oulu where cyclists have priority over cars. ps. Beautiful full moon yesterday evening! Just a little snow on the ground, please and the world would be a lot brighter place to ride at night. Last week I was on my way home from downtown when I noticed one of the fishermen got a fish so I decided to stop and see if they got another one. The photo is taken from a bikeway bridge crossing the "canal" coming from the hydro power plant. The power plant is maybe 300 meters to the right, upstream. Other fishes will be captured too. Some must be released (salmon, trout etc and some other fishes if they're too small). He caught one! I'm not sure if this one was legal to eat or one to that must be released. They took it out of the net and rushed it away. Obviously it was not one they could kill on the spot. What did they do with it? Either released back to the river or to a barrel where they keep the female whitefish with roe. They can't just throw it back to the water as it's too high. They must get to the stairs behind the trees in the pic above. This week there has been two foggy days (or was one of them last week?) Cold air meets warmer air from the sea. Last two weeks have been cloudy and rainy, and the temperatures have been above average. Even at night it's been above freezing, but on the other hand it's been about +5C during the day, too. These two foggy photos are resized, otherwise unedited so they're a bit darker than what the eye saw. They were taken at about 4pm. Sunset on that day was 15:50. Due to the daylight savings scheme, sunsets jumped one hour earlier when we adjusted the clocks last Sunday. The first photo is taked towards the combined heat and power plant, but it's hidden in the fog. Even the railway bridge is hard to see, and that's just three hundred meters away. Yesterday Very Northern Florida was hit by a storm. It rained, and the wind gusts were over 25 m/s. The winds came from the south and pushed the sea towards the Bay of Bothnia with it. The sea levels rose more than a meter above average, but I've not heard of any damages or casualties at sea. The wind did some minor damage on dry land. Yes, there was a picture of yet another collapsed scaffolding in the newspaper. Aluminum tube scaffolding is light and easy to build, but due to it's light weight it's easily tipped over by wind. Some trees fell or snapped in two, the bikeways have plenty of debris on them. Fallen leaves, needles, branches all over. In the photo below, the tree has been cut to smaller pieces with a chainsaw, then dragged into one pile waiting for Mr. Tractor Guy. A regular road about 10-15km from downtown. Basically all trunk roads on the countryside look like this. There's no shoulder to ride on. The gravel is lower than the edge of the asphalt, so one can't ride there. Cyclists are supposed to ride a little to the left of the white line. There is no alternate route, so I had to ride on this road. Coming back, just a few kilometers closer to the town. You see streetlights above, although they're for cars, not for cyclists. The shoulder is wide enough to ride on. Still, it's less than a meter wide and this is a 100km/h (I think, I've never driven a car on this road :-) area so it does not feel nice when cars and trucks pass me. On this strech, I did not have to ride on the road, but I did so to get the photo. There's a bikeway about 100 or 200 meters to the right, closer to the houses behind the trees. There's no question which route is nicer. Almost a month since the last post! Well, I've been busy watching "Big Brother 2011" on tv and what time was left I was doing something else. A few days ago it got below zero C during the night, but that was just the first warning. Today the weather forecast says temperatures between +4 C and +11C and rain for two days, as a low pressure moves over us. Maybe it's just a regular low pressure zone or is it the remnants of one of the hurricanes that hit the east coast of US a few weeks ago?